There is a time for all things. Sometimes, those times just occur simultaneously. It’s been a season of multiple “times” in my life recently. I’ve had times to do all of the things listed above; I feel like the last year has included every activity under heaven. Illness and death, graduation, painful separations from people and places that I love, relocation, new risks, leaving old dreams behind and realizing new ones. And then there is that rare moment when a dream you thought was dead is plopped down in your lap again. Literally. When I left Chattanooga in July, I thought that I was leaving behind my dream of fostering and adopting. After more than two years of training and several possible placements that went to other homes, I moved to Louisville, terrified at the change to come, but perfectly content being the single girl in a new city. I moved in stages over the next couple of months, slowly bringing what I needed as I needed it. 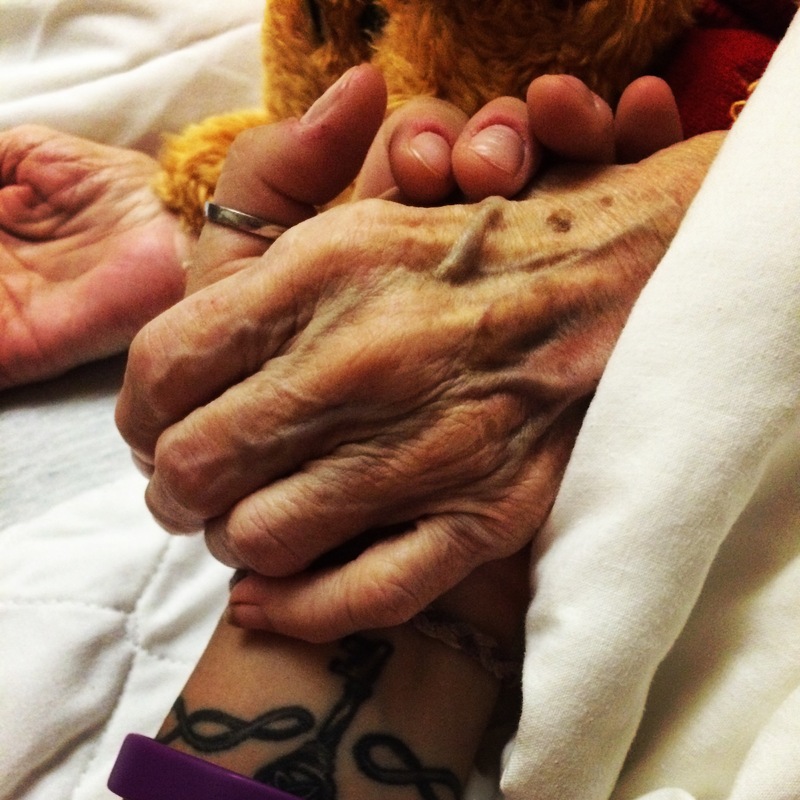 When we moved my grandmother to the Hospice unit, we realized she was most comfortable on her side, but she needed a pillow to prop up her arm. My back seat is always full of stuffed animals, so Pooh ended up being the pillow my Nana hugged. I love this picture. It’s a reminder of the love and support I know I always had from all of my grandparents. She is the one stepping into eternity, but it looks like she’s holding me up. It now hangs over my desk at home as a sweet reminder that no matter where I may go, I have a support system that is always holding me up. My grandmother’s death allowed me to have a space, a home for new life, and when I moved out of her house, I thought that dream had ended, or at least been delayed indefinitely. The last few months, though, life and death have been intricately intertwined, a precious reminder that there are different times in life, and sometimes they really do happen all at once. Life and death and love and eternity. All powerful words, all captured for me in the image above. 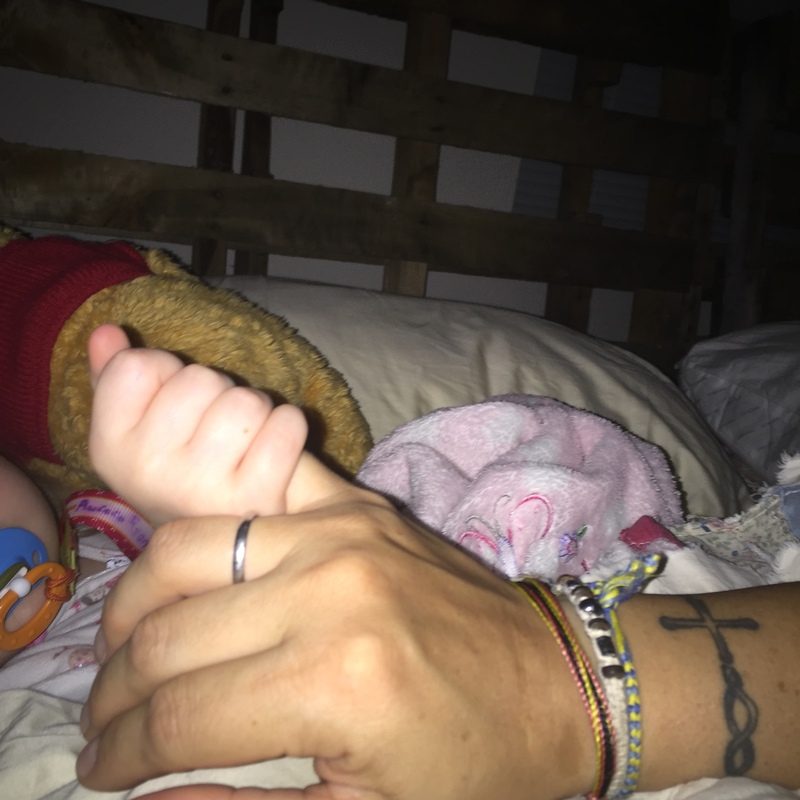 There’s someone else, cuddling Pooh with one hand, and hanging on to me with the other. One moment is a sweet reminder of memories made and a life well lived, a legacy to uphold. The other moment is a precious promise, a new and unexpected life to cherish and protect, a generation to whom that legacy will be passed. The last month has been a whirlwind of preparing my grandmother’s house to be sold to a different young family. Several weekends I have gone back to Chattanooga and have simultaneously closed a chapter with my grandmother and begun writing a new chapter with my own kids. These intertwined times were literally being separated into different boxes, what was being preserved, what will be moving to Kentucky. But the best moments were when those old memories were packed up to come to Louisville for Big Sister and Little Man. Books and toys and highchairs that have been used and loved by generations of kids in my family are being used again. And my Nana would be thrilled to see that. My worldview recognizes that life is a line; there is a beginning and an end to time itself, and it’s not stopping for anyone. But even while time marches on, the seasons and rhythms of life remain. There are circles and connections, and sometimes the time to laugh and the time to cry may just happen at the same time. Just like spring comes after winter, new life is born out of death, and occasionally, we get to be there to see both the end and the beginning. And both are good. And by the way, that Pooh has officially been designated a family heirloom.